This introductory text provides clear guidance for basic counseling skills for beginning practitioners. Clinical skills, supervision, the process from the first session through termination, and ethics are all highlighted. Case examples in each chapter demonstrate the clinical challenges often faced and the implementation of skills presented. Exercises encourage readers to engage and self-explore as they discover their personal counseling styles. Online counseling, trauma psychotherapy, and play therapy are three unique topics explored in this book, helping practitioners keep up with the constantly evolving field. 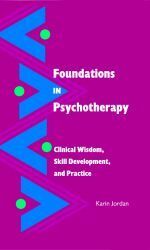 Foundations in Psychotherapy is the ideal text for courses focusing on helping skills and cutting-edge techniques.